Stays that include the following days require a 4 night minimum: Fri, Sat Sorry, but the dates you selected require a 4 night minimum stay. Please adjust your search and try again. Stays that include the following weekdays require a 4 night minimum: Fri, Sat Sorry, but the dates you selected require a 4 night minimum stay. Please adjust your search and try again. Play 4 rounds and the 5th Round is FREE. Courses Include: Heritage Club, Legends Heathland, Moorland, Parkland & Oyster Bay. Legends - 5th Round FREE! 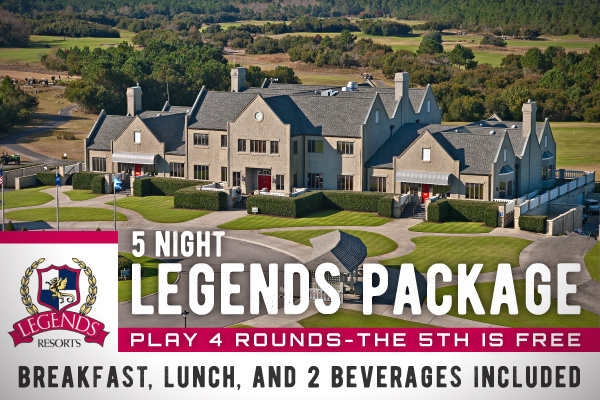 Play 4 Rounds of Championship Golf and Get a 5th Round FREE! DISCLAIMER: Package based on quad occupancy in a 2 Bedroom Golf Villa. Advertised from rate based on best available rate period for each season. Rates will vary based on stay dates. Complimentary round of golf must be played after 1:00 PM in the afternoon. Dining voucher to Divine Dining Group is valid for up to $15 credit on food purchase. Valid at Bubba's Fish Shack, Nacho Hippo, Pawley's Raw Bar, Ultimate California Pizza & UCP Game Zone locations only. No cash value. Not valid with any other offer.